Our woollies have been getting a little warm lately, especially since we’ve had a few days around 80 degrees F.–which is fairly hot for late-April. So, after re-scheduling with our shearer twice due to rain, we finally sheared, trimmed hooves, and de-wormed all of our lovely sheep last Tuesday. Now, they’re ready for warmer weather! Clover, Heather, and Ivy basking in the late morning sun. Really lovely! So warm weather, much suns 🙂 It’s cold and rainy here, eight days in, and I find I long to stretch out on the green grass next to your sheep. I would share their contentment. Thank you. 😊 Everything is so lush and green here now. It still amazes me how quickly the landscape changes from winter to spring. It’s like living in a completely different place! We had about five consecutive days of rain a week ago, and I was definitely ready to see some sunshine. The sheep are mainly content to have the shearing, hoof trimming, and drenching behind them. They’re getting grumpy in their old age (10 years) and aren’t very keen on being “handled.” The process took longer this time, and Farmguy and I were a little worse for wear. 😉 But, we still love it and feel fortunate to spend time with our sweet sheep. They say Sunday we will see the sun again, and I look forward to things drying out a bit. The weather has really been up and down here as well. 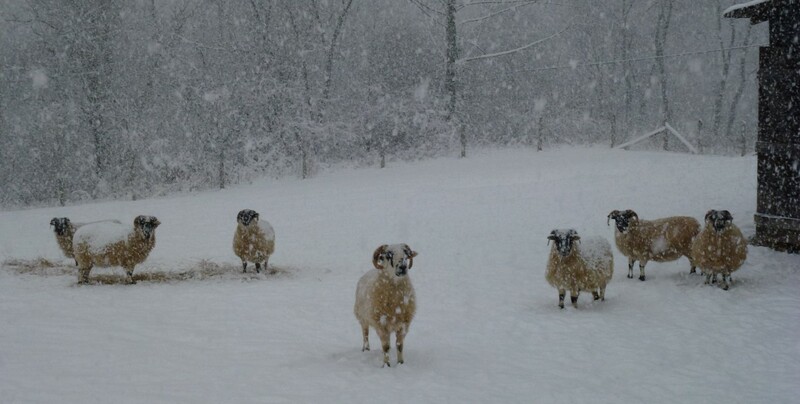 I think the sheep will be more comfortable with the temperatures rising. The Bean says your sheep are very brave … when she had her teeth descaled she had an anaesthetic and the vet took the opportunity to give her a pedicure as well! I say how wonderful the weather …. we had it at 80 degrees for a week and then last week it snowed heavily and winter returned with a vengeance. I hope for sunny days for us and for the local sheep very soon! Sweet, little Bean sounds very brave, too. I think the difficulty for animals is they don’t understand what’s happening to them–even if it’s in their best interest. Wonderful photos. I once watched Vermont farmers sheer their sheep with the old had clippers that look like sideways scissors with wide V-shaped blades. They were amazing. So fast. I can only imagine aching hands. Professional shearing is really amazing to watch.